SADiE 6 Software is the foundation of all SADiE products. All SADiE audio recording and editing systems use standard Broadcast Wav (BWF) file format, .wav or Macintosh® AIFF files (or any combination), on either PC or Mac formatted discs or standard networks. Edit files can be imported and exported using various common methods and SADiE can also integrate with leading broadcast automation systems to ensure complete compatibility with your existing or planned workflow. With 'mirror' recording to dual hard disks and with automatic backup of your edit files, SADiE is the robust solution you can depend on. SADiE 6 software marks another major step in the evolution of high-quality audio recording and production tools in the computer environment, allowing a choice between proprietary audio I/O and DSP processing, or standard soundcard I/O and DSP functions running on the host computer. In addition to the enhanced flexibility of the Windows environment for audio I/O and signal processing, SADiE 6 provides a new platform that will deliver many new and improved capabilities as user requirements evolve, including changes to the philosophy of the automation system and improved and updated capability to support 3rd-party pug-ins. 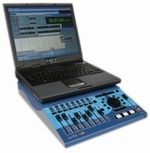 The SADiE 6 LiVE range of hardware multi-channel recorders is ideally suited to location recording, including connection to consoles for recording live performances. The LRX2 is a powerful multi-channel recorder and editor, capable of recording and editing up to 64 channels through a MADI interface, or 48 channels using a choice of digital and/or analogue Input/Output cards. LiVE H64 and H128 are 4u 19" rack hardware recorders with MADI interfaces, or with analogue inputs in additional 19" rack units. All "LiVE" branded recording packages are supplied with "Multi-Track Recorder" software ('MTR') providing a straight-forward intuitive user interface for the demands of recording on location, and are compatible with SADiE 5 and SADiE 6. Used extensively for mastering and broadcast studio work with broadcasters and production companies around the world, these systems are all based on rigorously tested DSP engine hardware. Depending on your requirements, each has different Input/Output connections and DSP power enabling your recording, editing, mixing and delivery methods to be tailored to your needs. From the 4 Input/Output PCM4 (with 24 internal tracks), to the 16 Input/Output H-16 (with and 64 internal tracks), these are self contained, 4U rack-mount PC 'turnkey solutions'. They all include the PC, Windows® Professional, drives, software, dedicated SADiE hardware and SADiE Breakout Interface. These extremely powerful systems are typified by their high channel count. Available as PCM-H64 (64 channel) or PCM-H128 (128 channel) versions, they come as either 4U MADI only, or 7U expanded versions. The expanded versions add a combination of AES digital Input/Output, analogue line Input/Output and Mic input to the MADI variant. Each PCM-H Series system comes complete as a self contained rack-mount PC 'turnkey solutions', and includes the PC, Windows® Professional, drives, software, dedicated SADiE hardware and SADiE Breakout Interface. The LRX2 location recorder also uses the same basic architecture and is also capable of recording 64 channels over MADI.